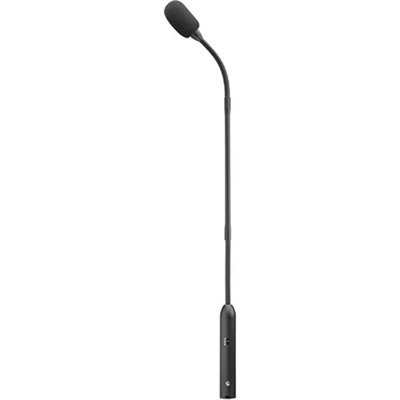 Product #46002 | SKU A3C18 | 0.0 (no ratings yet) Thanks for your rating! The 18" A3 (Cardioid) from Countryman is a podium condenser microphone designed to provide clear voice reproduction for use in meetings, conventions, lectures, and houses of worship. It features dual capsules tuned for clarity, wide frequency response, low noise, and a high maximum SPL of approximately 130 dB. Integrated damping, along with the dual-cartridge design, attenuates thumps, rumble, vibration, and handling noise. The mic’s shielding and circuit design protect it from picking up interference from radio frequencies. The supplied windscreen reduces the level of breaths and plosives. A standard XLR 3-pin male connector allows you to connect it to most mixers and mic preamps. The A3 is powered by 48 VDC phantom power. A protective case is included. Box Dimensions (LxWxH) 25.8 x 3.3 x 3.2"